Abu Dhabi, 24 February, 2013- Finance House PJSC (FH), have exempted its corporate clients from paying all the new fees imposed by the Ministry of Labour (MOL) to issue Labour Guarantees. FH have added new features to its existing Smart Guarantee product (SG), where it will cover the entire AED 28 charge on behalf of establishments operating in the UAE, and will also pay them interest on their deposited guarantees. Mohammed Wassim Khayata, Group Chief Operating Officer at Finance House, said: ”By this new service we are paying on behalf of our customers the entire AED 28 per labour or employee”. “Adding these important features to our Smart Guarantee product, forms a winning deal for all establishments in the UAE market, through a service that exempt them from all fees and charges and also pays them interests on their deposited guarantees”, continued Khayata. “Unlike other institutions, we are simply offering the opportunity to relief our customers from the Labour Guarantee charges and paying them at the same time interest on their deposited guarantees. At Finance House we always strive to give in terms of service and value”, concluded Khayata. 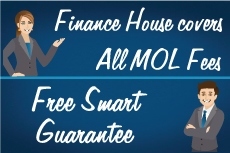 The Smart Guarantee product is a free of charge Labour Guarantee offered by Finance House to all establishments operating in the UAE, where FH is authorized by the Ministry of Labour to issue Labour Guarantees with a direct on-line access to the MOL computer system to facilitate instant on-line issuance of Labour Guarantees. Earlier this month, the Ministry of Labour has adopted a new fee structure whereby each guarantee now costs AED 28 per labour or employee, to be paid by the Second Generation of e-Dirham (e-Dirham G2), that is considered the latest effective payment technology offering an easy and safe method for electronic payments and collection of revenue for both governmental and non-governmental fees. Finance House offers a wide range of business products that include Commercial Finance, Corporate Finance, Labour Guarantees, and Payroll Distribution Solutions. It has been awarded at the Banker Middle East Industry Awards ‎‎2012 as the Best Business Finance Company in the Middle East, and retained the Best Retail Finance Company in the Middle East for the second consecutive year.